Cheap office computer. The HP 250 G6 costs around €500 (~$615), for which you get a 15.6-inch notebook with a Core i3 processor, 8 GB of RAM, a Full HD display, an SSD, and a good battery life. Update: HP 250 G6 4BD30ES Kaby Lake version with an Intel Core i3-7020U and SanDisk SSD tested. Model: The HP 250 G6 2UB93ES is a 15.6-inch budget laptop targeting entry-level users. As for design, the 250 G6's case is made of plastic. HP finishes the 250 G6 in silver color. It is designed to combine robust design with mobility and affordable features. 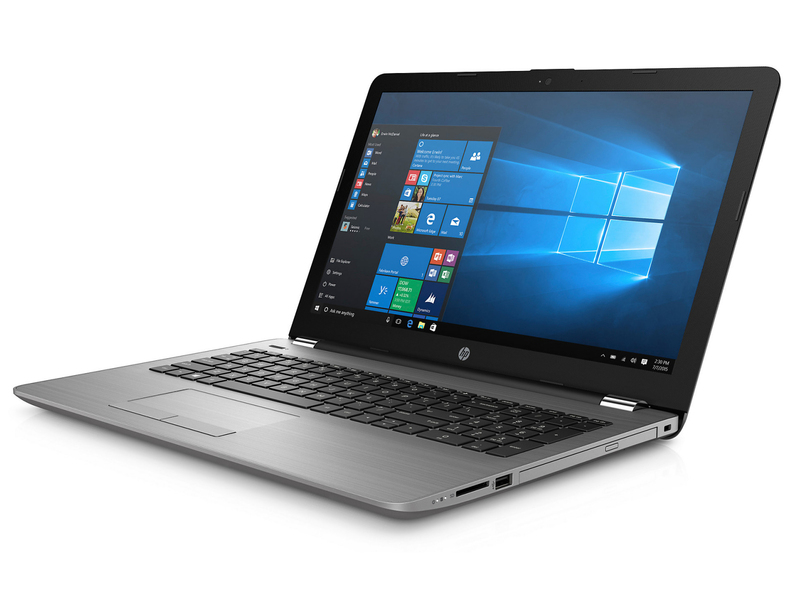 The HP 250 G6 is equipped with a rock solid Intel Core i3 paired with 8 GB of RAM and a fast SSD. These are very good basis for everyday tasks. While the Core i3 processor will not break any performance records, it provides enough performance for office and internet applications. Better still, the device remains cool and quiet throughout. Besides that, the HP 250 G6 has an SSD with 256 GB of storage space, of which 191 GB are usable after installing Windows 10. It is a pretty good deal for a laptop at this price range. The SSD ensures fast and smooth system performance. It would have been better had HP included a maintenance hatch rather than having to remove the entire base plate for general maintenance and repairs. An Intel HD Graphics 520 handles the 250 G6’s graphics. The GPU can clock up to 900 MHz and supports DirectX 12. The GPU performance could also be improved by enabling dual-channel mode and adding a second identical RAM module. The 250 G6 could be used to play games, but only for games that have low system requirements. The features of the display are a Full HD resolution (1,920 x 1,080 pixels) and a matte surface, which is great because it will not reflect environmental lighting. However, the TN display has poor viewing angles, which means that the 250 G6’s display is practically unreadable from an off-center angle. The display is only readable outdoors when the sun was not too bright. The 250 G6 has good battery life. The 250 G6 has a longer runtime thanks to its better energy efficiency from the i3 processor and larger battery capacity. The 250 G6 is having a 41 Wh battery capacity which is capable of delivering up to 7 hours of battery life. Microsoft Windows 10 Home 64 Bit is pre-installed on the laptop. For network connectivity, it has Realtek RTL8168 / 8111 Gigabit LAN, Intel Dual Band Wireless AC 3168 (a / b / g / n / ac) and Bluetooth 4.2. As for connectivity, it has a USB 2.0 port, two USB 3.0 / 3.1 Gen1 ports, a VGA port, an HDMI port, a Kensington Lock, an audio combo port and an SD card reader. The laptop has a DVD writer, which is not commonly equipped with latest laptops. It is good for reading and writing DVDs on the go. 6006U: Skylake-based ULV dual-core processor for thin notebooks and ultrabooks. Offers an integrated HD Graphics 520 GPU and is manufactured in 14 nm. The maximum clock speed is only 2 GHz and Turbo Boost is not supported.» Further information can be found in our Comparison of Mobile Processsors. 74.85%: This rating is bad. Most notebooks are better rated. This is not a recommendation for purchase.